A Flying Dutchman from Amsterdam – what could be more appropriate? In fact, this recording is as international as any Wagner performance, the orchestra itself the only Dutch contingent (even the choirs are German). Based on two live performances given in May 2013, the recording has much to offer, not least the cast of world-class soloists that would be the envy of any opera house. The greatest interest, though, is likely to be generated by the young Latvian conductor Andris Nelsons – hot property in Wagner just now, as he is in Mahler, Strauss, Tchaikovsky and … just about everything else. He certainly makes this Dutchman his own, and he clearly knows how to get the best out of the assembled company. One aspect, though, of Nelsons’ performance is likely to meet with controversy: his tempos. Everything here is slow – not to the point of ridicule, but almost always well behind the norm. That really stands out in a work that is more often presented as a single, breathless expanse, as best exemplified by Barenboim’s Berlin Staatsoper recording on Teldec. Barenboim whips up a storm in the opening bars, which never seems to subside until the very end. Nelsons takes the opposite approach. The energy he generates in the opening bars has already dissipated by the time we reach the second theme. The results are more considered and more episodic. Fortunately, Nelsons always keeps the tempos flexible – there is space here for momentum when required – and finds an appropriate pace for each section and scene. His approach is most effective in quiet, ruminative passages, like the timpani introduction to Daland’s “Mein kind, du siehst mich auf der Schwelle…” in act II. The downside is that the storms never quite have the energy we are used to experiencing. The big names in the cast all deliver, and singing-wise this is a very satisfying recording. Kwangchul Youn and Terje Stensvold are both known quantities as Daland and the Dutchman, and both give commanding performances here, even if they are frustratingly difficult to tell apart. Arguments rage over the relative merits of Anja Kampe and Nina Stemme, but for the time being, Kampe seems to be the first choice for Senta. Her performance here is powerful but nuanced. Her vibrato can be heavy on the ear but is certainly appropriate to the repertoire. Less convincing is the way she swoops up to the high notes – a deliberate phrasing device no doubt, but one that feels like an affectation after a few minutes. She also breaks phrases for very obvious breaths in some exposed passages, though perhaps this is a consequence of Nelsons’ slow tempos. Christopher Ventris has a lot of character and presence as Erik, it is just a shame that his tuning is occasionally wayward, only in a few passages, but enough to stick in the memory. 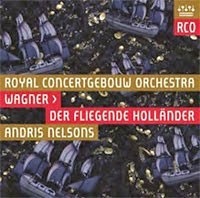 As so often with orchestra own-label recordings of operas, the real star here is the orchestra itself. The Concertgebouw is on top form, and the recording engineers seem to have prioritised their contributions throughout. In the runs in the overture, every note in the violin parts is audible, and the balance and clarity of the inner textures is always impressive. The deep, rumbling timpani are satisfying too. Vibrato from the solo horn might jar in some ears, but it is only very slight. Excellent choral singing too, from the WDR and Bavarian Radio choirs (how did they get this gig?) – larger forces than you’d hear on an opera stage, but the added heft is used to impressively dramatic effect. No SACD for some reason. Any concerns that RCO Live has dropped the medium are allayed by more recent releases, including an impressive Bruckner 6 and 7 with Mariss Jansons (review to follow). The difference in resolution is obvious, but this is still a very well engineered recording, and aided at every step by the warm but clear acoustic of the venue and the orchestra’s affinity with its many virtues. RCO Live provides a libretto in German, English and French, an increasingly rare luxury, but a deciding factor for many prospective buyers. Mixed views then. Nelsons’ slow speeds set this apart from the burgeoning competition, though not necessarily for the better. Most of the cast can be heard singing these same roles in equally fine recordings elsewhere. Definitley worth hearing for the orchestra itself, and perhaps too for Nelsons’ idiosyncratic approach, if other recordings leave you short of breath.